We’ve arrived at our Camp 1, Canada Camp, and we have moved in. We are all sitting around in the dinning tent right now. Maria, Sergio and Alex prepared a wonderful tea time with us with popcorn, several different kinds of snacks and a bunch of different varieties of tea. It is all spread out on a beautiful Bolivian cloth. Margaret just could not believe we were doing this at 5,000m. Actually, none of us can! But we are fortunate because right now we have no wind. 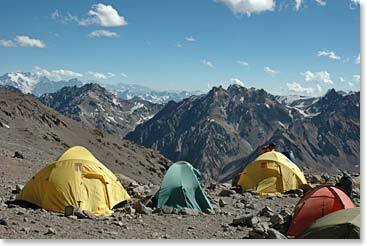 In fact, it’s a beautiful day, even high on Aconcagua. Forecasts are for increased winds as we climb higher. 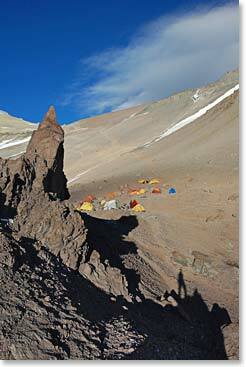 We hope to reach Nido de Condors, our camp 2 tomorrow where we will be doing a carry, or an acclimatization walk. And up there, if the forecast holds, we will be seeing some very substantial winds, the forecast says 60 to 70 km an hour. But first things first, we are acclimatizing here at Camp 1. If you follow Berg Adventures Aconcagua dispatches in the past years you may recall that this is always taco night! I don’t remember how this tradition started, but we start grilling quesadillas, tortillas, variety of cheese’s and vegetables and a little bit of hot sauce for those who want it. 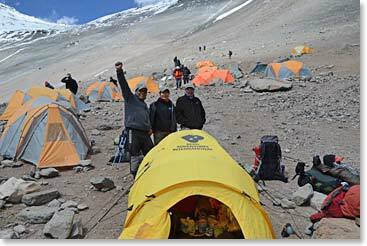 We enjoy taco’s, along with lots of fresh soup at 5,000 m, Canada Camp on Aconcagua. Our Bolivian team wave from Camp Canada where they prepared a delicious team time for the group.